The flat season is starting to hit top gear. Tomorrow sees the start of the three day Craven Meeting at Newmarket and last Friday and Saturday we had the best flat racing of the season so far, as Newbury hosted the Greenham Meeting. Making his seasonal reappearance in the 1m 2f conditions race on the Friday card given a hold up ride, pushed along three out, he ran on nicely in the final furlong to finish third. Although he never looked like he would catch the first two, this was a good effort on just his second career start. The way he finished off his race means he should appreciate a step up 1m 4f or further. It’s early days, but he already looks like a St Leger horse to me. Andrew Balding has his horses in great form. In the past 30-days he’s had 13 winners from 49 runners 27% 22 placed 45%. This good form carried over to Newbury. He sent seven runners there, three of them won and two more finished second. The most impressive of his three winners was Happy Power’s who won the 7f handicap on Friday. A winner of two of his four starts as juvenile. The handicapper had put the 3-year-old up 10lb for his win on his final start of last season. The rating's rise wasn’t a problem, as the colt easily brushed aside a decent looking field to win by 5 lengths. We know Happy Power handles cut in the ground but it will be interesting to see how he goes on quicker ground. He looks capable of more improvement and could be a pattern horse in the making. Marmelo. who was last seen in action finishing second in the Melbourne Cup, put in a good performance to win the 1m 4f Group 3 that opened Saturday’s Newbury card. The race had on paper looked like a match between last year's winner Defoe and three-time course winner Young Rascal. However, the two market leaders both under-performed in a slowly run race turned into a bit of sprint for home in the straight. For a horse who has done most of his winning at 1m 6f/ 1m 7f, Marmelo was the one who showed the better turn of foot. After the race trainer Hughie Morrison talked about going back for another tilt at the Melbourne Cup. However, the 6-year-old's short term target is the Group 1 Coronation Cup at Epsom. It tends not to be the strongest Group 1 middle-distance race of the season and there is normally a small field of runners. It's a race I could see him run really well in especially if the ground was to be good or softer. The Group 3 Fred Darling Stakes is considered a 1,000 Guineas Trial but it’s 20-years since the winner went on to win the first fillies classic. The once raced, Dancing Vega was sent off the 3/1 favourite but she was a bit keen in the early stages of the race and didn't give her running. The eventual winner Dandu who had improved with each start as a juvenile, ending last season with a 1 ¾ length, second to Just Wonderful in a Group 2 at Newmarket in September. That form was some of the best on offer in the race, so it was a little surprising that she was sent off at a generous 8/1. The daughter of Dandy Man has trained on from two to three and was given a fine ride by jockey Gerald Mosse. Making good headway two furlongs from home she hit the front inside the final furlong. Her jockey then nursed her home as she just held off the late lunging Iconic Choice by a short head. I think she will come on for this run and unlike some other pundits I really liked the filly's performance. If she takes her chance in the 1,000 Guineas, she has each-way claims if the going is good or softer. The Greenham Stakes has been a traditional launch pad for top 3-year-old colts. Frankel won this race before going onto win the 2,000 Guineas. Other recent winners Kingman and Barney Roy both went onto finish runner-up in the first colts classic. The late defection of 2,000 Guineas ante post favourite Too Darn Hot, due to heat in a leg, robbed the race of its main attraction. The absence of the hot favourite shouldn’t take away from the win of Mohaather. The colt who had won the Horris Hill over C&D on his final start as a juvenile. Once again, he probably handled the tacky ground better than his rivals. Striding clear inside the final furlong. If he hadn’t have hung toward the stands rail in the final furlong, he would have won by more than the final ¾ length margin. Plenty of people are questioning whether the colt will stay the mile of the 2,000 Guineas. On breeding there are mixed messages, his sire gets plenty of sprinters, however, his full sister Prize Exhibit won a Grade 2 Handicap over an extended mile at Del Mar which gives his Guineas supporters plenty of hope. Mohaather’s win was a big one for his trainer Marcus Tregoning. He probably hasn’t had as good a horse since he trained Sir Percy to Derby glory back in 2006. Could he have another classic winner on his hands? 5:25 – Vanity Vanity – The 4-year-old remains a maiden after 12 starts on the all-weather and turf. Still she has run some good races in defeat over the winter at Lingfield off her present mark of 60. Including when last seen 52-days ago. The filly’s best turf form has come at Windsor on good to firm ground. She can now race off a 9lb lower mark and can take advantage of her drop in the weights. Something for everyone today, jumps fans have Ayr and the Scottish National to get stuck into, and for the Flat fans among you, there's Newbury's quality card, with the first of the Classic trials. 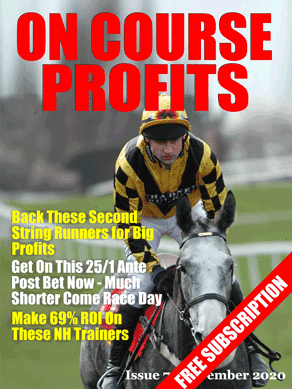 Plus the tricky Spring Cup too, and it's all covered on the preview today. Landed the Huntingdon Colossus yesterday, which was good, but we could have done without the favourite winning the last. Never mind. There will be more Colossuses up for Ayr and Fontwell around 12 today, I have done the Ayr card for the Sporting Life, so if you want a runner-by-runner assessment on what looks a very tricky card, feel free to have a read. For today, a few to follow that should should be winning a race in the near future that I've seen on my travels this week. Couple of quiet days coming up before the weekend, not a lot to say so I'll put a Huntingdon Colossus or two up to keep us interested today. My thoughts on the card on the main piece.